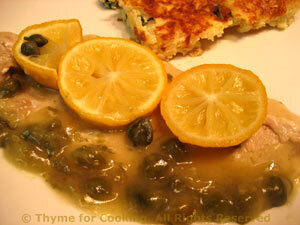 Thyme for Cooking Dinner tonight: Turkey Cutlets Piccata. Quick cooking turkey, potatoes and onions simmered in stock and cauliflower with a cheese and yogurt sauce: a fast, easy and delicious mid week dinner. 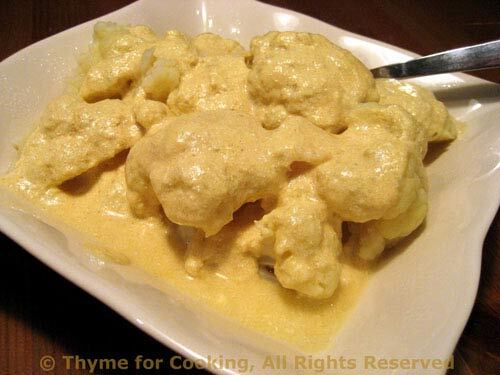 Use yogurt if on hand, for the cauliflower, otherwise milk or a bit more stock. Thinly sliced turkey cutlets cook quickly and are a great substitute for the veal cutlets normally used in this dish. If you can't get them get a turkey tenderloin and either slice it into thin cutlets yourself or ask your butcher. You could also use boneless, skinless chicken breasts. Slice the lemon and pick the seeds out of the slices. In medium nonstick skillet sauté the onion until tender. Move onions to sides of pan and sauté turkey cutlets until lightly brown on both sides. Add the chicken stock, wine and the capers. Place the lemon slices on top of the turkey cutlets, cover, reduce heat and simmer 10 minutes. Remove turkey cutlets (with lemon slices on top) to a platter and keep warm. Stir in the cornstarch mixture and heat, stirring until thick. Serve cutlets with sauce on the side - sprinkle on more capers if you like. Instead of the usual boiled potatoes try this tasty alternative: Potatoes and onions simmered slowly in chicken broth, which they absorb by the end of cooking time. Heat oil in small saucepan, large enough to hold all ingredients. Sauté onion until tender, about 5 minutes. 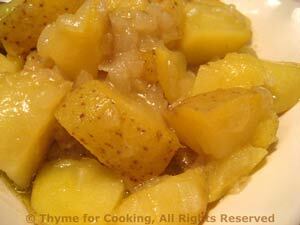 Cut potatoes into large chunks, about 1" (2.5cm). Add potatoes to pan, along with thyme and enough of the stock to just barely cover them. Bring to a boil, then reduce heat and simmer until potatoes are done and stock is absorbed, 25 - 30 minutes. Mind them during the last few minutes so they don't stick. Serve.